Deciding whether or not you need life insurance can be a complicated process. The good news is that there are a variety of different products available to fit each person’s specific needs depending on age and current situation. We will help you make an educated decision by highlighting some issues you should think about. If life insurance sounds like something you should have but can’t afford, you might be surprised. Term life insurance quotes for a hefty amount of coverage for young, healthy buyers is a few dollars a week – about the cost of a cappuccino. Yet most people – especially young adults – overestimate the price. The fact that life insurance can replace your income for your dependents if you die is the most obvious reason why someone should invest in a policy but there are several other reasons as well. If you happen to die prematurely, you still may want your children to go to college and your family to enjoy a certain kind of lifestyle. However, if you are the primary bread winner for your family, they may not be able to afford it if you die and do not have enough savings to cover their expenses. By purchasing life insurance you can address these issues and provide solutions. One of the many options would be purchasing a Term Life policy, which would cover you for a specific number of years. These policies usually range anywhere from ten to thirty years. The policy benefit is only paid during the term period that the insurance covers. This may be a good option if you want more affordable coverage for a set period. For example, until the children finish college. You also have the option of buying a Whole Life policy, which features level or fixed periodic premiums computed on the assumption that the policy owner can retain the policy for the life insured. The death benefit remains level which is a concept to make the whole life contract affordable for as long as the policy owner decides to keep it. There are several types and sub categories of each type, and they usually pay a benefit to your beneficiaries when you die. The premium amount will dependent on the policy you purchase. Many young professionals who are looking into investment options for their savings and these individuals may be interested in a variable life policy. This can provide a good additional to their investment portfolio. A variable policy allows investment in stocks, bonds, and mutual funds. These investments can allow your cash value to increase more quickly, but as any other investment tied into the market, there are some investment risk as well. The good news when choosing a policy with an investment feature, you can limit your risks by choosing one with a guaranteed minimum death benefit. In today’s market there are also policies that provide cash, flexibility and safely. 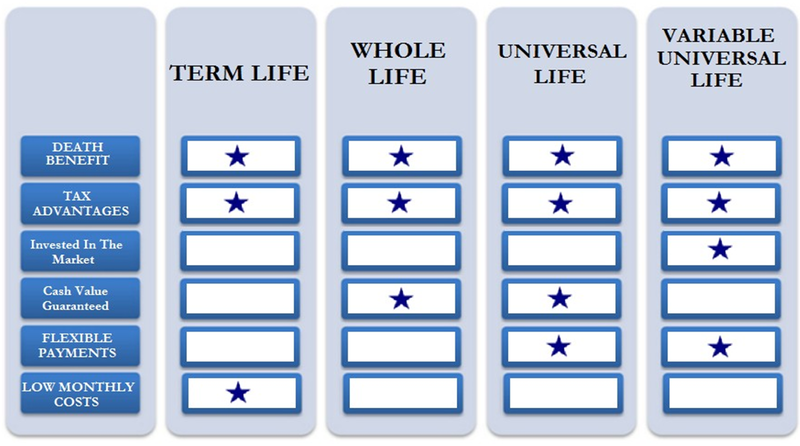 These policies are known as Indexed Universal Life policies. IUL policies offer tax-deferred cash accumulation for retirement while maintain a death benefit. These are for people who need permanent life insurance protection but which to take advantage of possible cash accumulation. With some insurance policies, you also have the possibility of allocating a portion of your premiums to a cash accumulation vehicle, an option usually available under universal life insurance policies which we touched on above. This accumulated amount can serve as a cash reserve, and can be used to pay insurance premiums if your disposable income is no longer sufficient to pay those premiums. With these policies you will need to ensure that the available cash is sufficient to prevent the policy being lapsed due to unavailability of cash. We usually sit with current and potential clients to educate them on these policies since they are reserved for more sophisticated buyers. Well, it depends on how much you would like to cover. You will want to make note on how much you earn, and how many years your family will need to replace that income if you die prematurely versus how much you have already saved. Also look at what items that you want to make sure would be paid for, such as college tuition for your children or any other wants or needs you may have. We can help you with these questions and make recommendations so you are able to make a well informed decision. Life insurance should not be dismissed, however it is not for everyone. If you have others who depend on you financially, then you may want to consider it. We can help you to decide which type of policy is best for you. Buying life insurance can be one of the best financial steps that you take for you and your family.